Introducing Yeti in My Spaghetti (Yes you heard right). The wacky fun balance game for children aged 4+. The rules of this game are simple, take turns to one by one remove the spaghetti from the bowl. 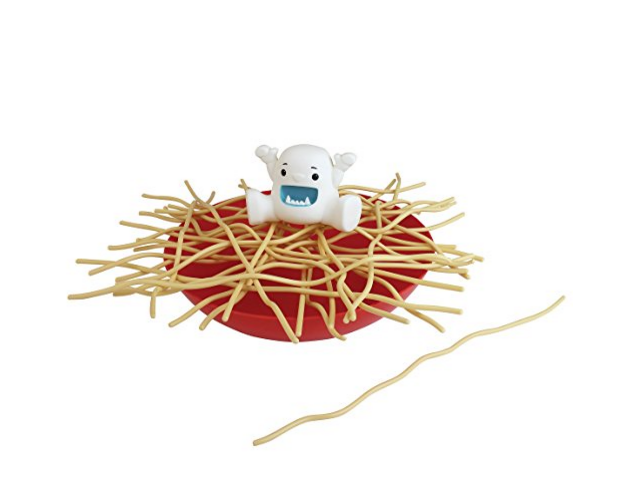 Its all about choosing the right pieces of spaghetti to keep the Yeti from falling into the bowl. The last player to remove a noodle successfully before the Yeti falls is the winner. The game is super easy to play and so perfect for children as young as 4. As well as testing your nerves this game is guaranteed to provide the entire family with squeals of laughter. University Games loves to create the opportunity to challenge your skills, while at the same time making the games fun and this is just what this game does. 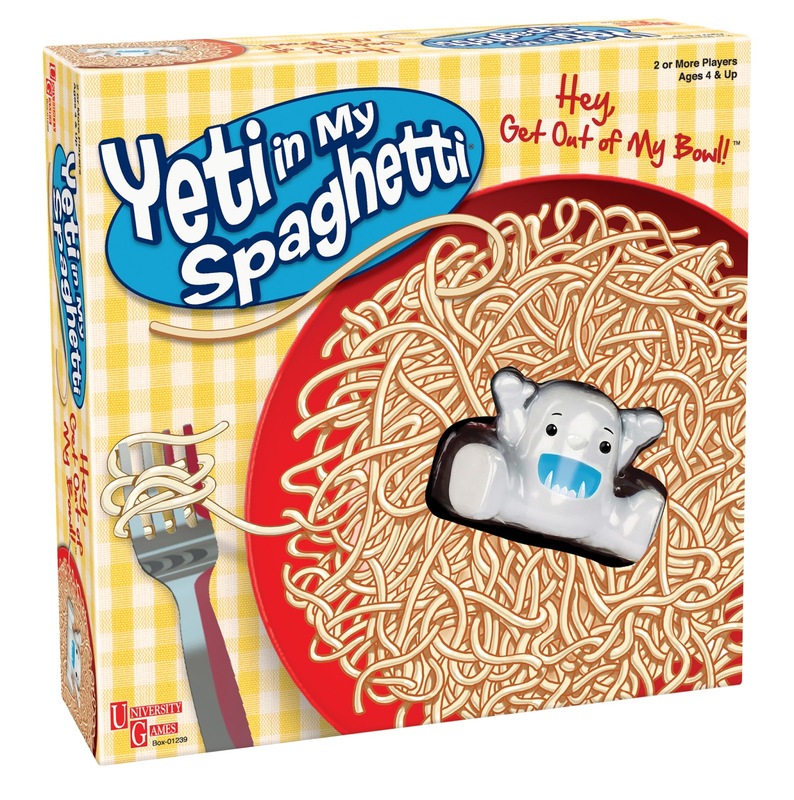 Yeti in My Spaghetti is a 2 or more player game and retails at £14.99. If you think this game sounds like fun then Enter the competition below where there will be not just one but two winners. Looks as fun as it sounds! It is interactive and it will test our nerves! Looks fun for me and my boy! It's looks a super, fun family game. We enjoy eating spaghetti in our house, so I love this game as it reminds me of one of our favourite foods. we love family game time!! It looks a lot of fun and it's great that it's good for anyone over 4. It is original and looks great fun! Seems like a fun game that all the family could play. Good for youngsters as could assist with dexterity etc. I like that it looks something a bit different, looks fun! wacky fun and a little skill. We love fun games that test the nerves! Plenty of laughs and suspense! Kids will love this game. I don't have any children but would love to win this prize for charity, to go to Romania. I love how random it is - a yeti paired with spaghetti?? I think my twins would just adore this silly game, and me too for that matter. I love the fact it's interactive. It looks like great fun. I love that the family can play. it reminds me a bit of the old pick up sticks game. Lots of cheating seemed to go on with my brothers. I love the wobbly wobbly spaghetti plus the fact both my children love yetis after discovering a couple of yeti books in the library! it looks really fun and my nieces would love it! LOVE the suspense side of the game! it's good for all ages, and everyone like spaghetti! The game looks like we would have a good laugh playing it as a family. Love that it is simple and fun for my son. That it's pretty simple to learn & play! It's a pain when reading the instructions takes longer than actually playing a game! It looks fun to play. I think it would make my grandchildren giggle! Looks great my kids will like it. It looks like a giggle. Love family games even though I never win lol.Great giveaway thank you. I love that it's a game of skill, it's a different type of game to ones we currently have. It looks funny I like the Yeti can imagine it must be hilarious pulling the wrong pieces out ! I think that the boys will really enjoy it so it will keep them quiet with no consoles in sight! It looks like a fun game for the whole family. I love the cute little yeti, great game, looks like fun. It just looks like a game for the whole family - and a lot of fun! My nieces would love this game! I could play this with my grandchildren, it looks so much fun. my daughter loves the games where your tense, like popping pirates and buckaroo. i think he would equally feel the same about this one. Looks looks great as it would be easy enough for my nephew but still hold my nieces attention - always so much easier when we can all play a game together. It's different to other mimicked games on the market. It makes a refreshing change and I know the girls would have great fun playing it. I think my niece's would love the game and learn what yetis are. I like it because it is a game for the whole family to enjoy and have fun with. I love the name of the game and how it rhymes. I love the simple concept - don't need a degree to understand the rules! It looks like messy fun!!! I just love games like this that are so different and fun. I love that there is a game with a yeti in it! It reminds me of the old Pick Up Sticks game which was wonderful for teaching children about planning a move. It's nice to see games that can be played by younger kids. Fun and not over complicated! This game looks great fun for all of the family, no doubt there will be lots of laughter playing this.